DENTON — Giving babies a chance at life is why the Knights of Columbus began donating ultrasound machines a decade ago to pro-life pregnancy centers across the globe. Jan. 14, a major milestone was met as the 1,000th machine was donated to Mother of Mercy Free Medical Clinic in Manassas, Va. 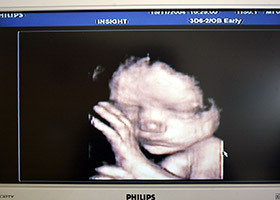 The Ultrasound Initiative, developed by the Knights of Columbus in 2009, is one of the greatest humanitarian efforts the organization has ever undertaken with more than $49 million in machines donated to pro-life pregnancy centers in all 50 states and Puerto Rico, as well as Brazil, Canada, Jamaica, Peru, and Africa. Supreme Knight Carl Anderson, along with representatives from Catholic Charities of the Diocese of Arlington, Va., was present at the unveiling of that milestone machine. Out of the 1,000 donations, 61 machines were placed in Texas with five of them being placed in the Diocese of Fort Worth. Loreto House in Denton, a pro-life apostolate of the diocese, received the state’s first donation on July 29, 2009. Randy Bollig, executive director of Loreto House, said the machine is a very powerful tool for the center, which sees about 20 women a day. 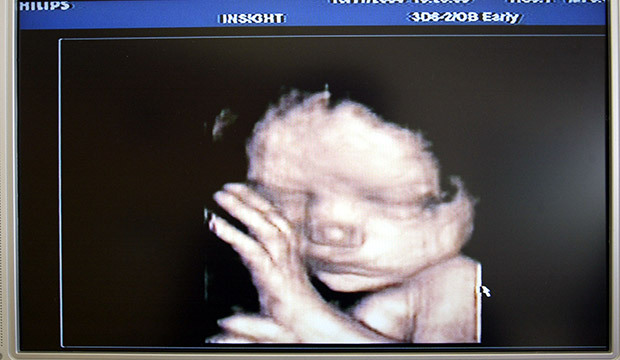 He said many women think their unborn child is just a blob of tissue in the early stages. 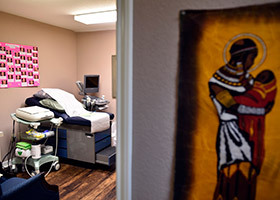 Among more than 50 pro-life centers in the boundaries of the Fort Worth Diocese, Loreto House and Mother and Unborn Baby Care in Fort Worth are the only two Catholic pregnancy centers, a number Bollig says needs to grow. Workers at Loreto House serve women in alignment with the teachings of the Catholic Church and offer resources to help the mother during pregnancy and for several months after the baby are born. Leo Hanus, a past Knights of Columbus state deputy in Denton, and his wife Lorraine were a part of making that first Texas donation possible. After they heard about the program, research began on how to purchase a machine and what type is best. Approved crisis pregnancy centers need to raise half the cost of the machine and the Knights of Columbus donate the other half, something still challenging for machines that can cost thousands. After connecting with a manufacturer willing to discount a $130,000 machine down to $50,000, Leo and Lorraine Hanus began fundraising efforts for the $25,000 needed. Many people reached out to help, including an “angel donor” who gave $20,000. For the Hanus family, pro-life is not just biblical but also personal. The couple in 1969 adopted the first of their three children. In 1971-1972 when the abortion issue was heating up, it became a very personal issue for the couple after they realized their daughter could have been aborted if her mother had not chosen to give her up for adoption. At that time, Leo Hanus was in development training at his job and was asked to write a report and give a presentation about a controversial subject. He chose abortion. Loreto House, 1100 N. Bonnie Brae St., Denton — placed July 29, 2009: First ultrasound placed in Texas and ninth placement in the country. Mother and Unborn Baby Care of North Texas, 1118 Pennsylvania Avenue, Fort Worth —placed Sept. 29, 2011: This was the 13th donation in the state and the 155th machine placed in the country. The Knights of Columbus Council in Bedford (7641) was the driving force behind this donation. All Babies Born Alive (ABBA), 214 N. Taylor, Gainesville – placed Nov. 28, 2012: No. 27 in Texas and the 282nd placement in the country. This donation was a joint effort of the Knights of Columbus Councils in District 16 with funds being raised in one night at an event held at the parish hall in Lindsay with the Muenster Knights of Columbus Council 1459 leading the effort. Loreto House, 1100 N. Bonnie Brae St., Denton — placed April 10, 2014: This machine was the 38th placed in Texas and the nation’s 437th. This second machine at Loreto House is a smaller ultrasound purchased to equip a van to do mobile ultrasounds. St. Mark Parish’s Knights of Columbus Council 12553 in Denton spearheaded the fundraising effort. All Babies Born Alive (ABBA) 650 South Edmonds Lane, Lewisville — placed Dec. 14, 2017: This machine was the 58th in the state and 878th in the country. ABBA opened a satellite office in Lewisville to address the needs of pregnant mothers in southern Denton, northern Dallas, and Tarrant counties. Lewisville Knights of Columbus Council 9884 spearheaded this fundraising effort.